In March 2015, the then owners of The Corn Exchange, Punch Taverns, announced their intention to turn the building into a national chain supermarket. Within 24 hours, there was a protest in Crickhowell High Street. Thousands of signatures were collected on petitions and traders ‘boarded-up’ their windows with brown paper to show the impact a supermarket would have on the town. A new company was formed under the guidance of former City Businessman, Dean Christy; Accountant, Peter Roberts; and Funding Expert, Andrew Grey; and Punch Taverns agreed to sell us the building instead of turning it into a supermarket. We raised enough money to buy the building and start converting it. The Corn Exchange, a listed building, had fallen into serious disrepair. You can see some of the problems we faced in this video. But we overcame them with the help of our builder, Celtic Property Ltd, and the support of our shareholders. The Corn Exchange was opened by the Prince of Wales and was at the heart of Crickhowell’s successful bid to win the Best High Street in Britain Award in 2018 – achieving UK-wide recognition. Our MP, Chris Davies, even raised it in Parliament. After the High Street win, Tim Jones, who had been involved with the project from the first protest, stepped down from the board of Corn Exchange Crickhowell Ltd. The company adopted a more streamlined structure in keeping with its new role as landlord to three shops and three flats. 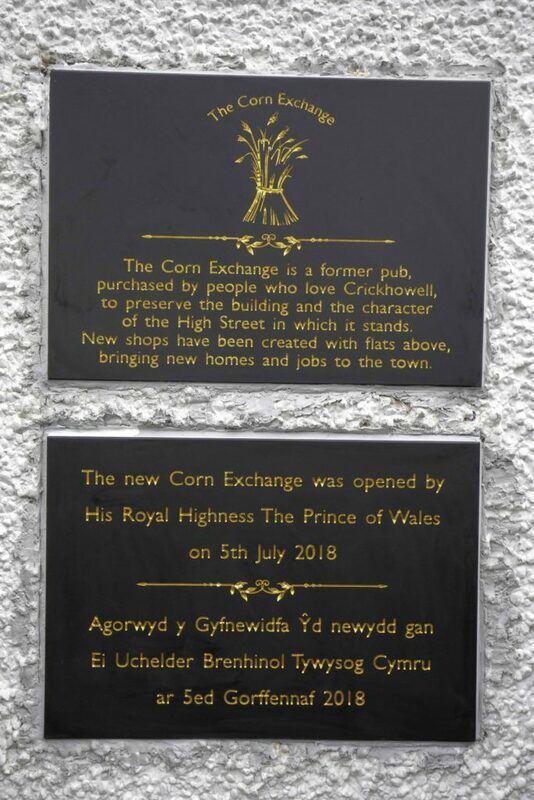 But the Corn Exchange’s role in protecting Crickhowell High Street will never be forgotten as plaques commemorating the visit by the Prince of Wales and the Great British High Street are now built into its walls for everyone to see. APPLICATIONS FOR GBHS FUNDING REACH £52,000.